Take a Hawaii Beach Vacation! Could anything be better than a Hawaii beach vacation? The Hawaiian islands - and their beaches - each have their own personalities. Whether you're looking for surf or sand, there's a Hawaii beach for you! Oahu is known for its surf; the Big Island for its black, red, and green sand beaches. Maui has some great sand and snorkeling; Kauai has soft sand and spectacular scenery. And the water!! It is truly a ribbon of turquoise, blue, indigo and deep purple. I've never seen anything like it. For those of us on the mainland, a Hawaii vacation on the beach is a dream come true - and often a once-in-a-lifetime trip. It's a long flight and even a vacation package can be costly; but once you've had a Hawaii beach vacation, I'm sure you'll be back again and again! The Big Island of Hawaii is the southernmost of the Hawaiian islands, and the "youngest". All of the islands were formed by volcanic eruptions, and the BI has the only currently active volcano in the islands. The BI is constantly growing, thanks to the lava flow from Kilauea Volcano. As a result, the sand at many of the beaches is more coarse than on Oahu, Maui or Kauai and the beaches are smaller. But the BI has many black, red, and even green sand beaches - something you're not going to see anywhere else! 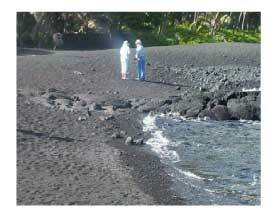 The black sand at Punaluu Beach, located along the southern coast (closest to the volcano) is home to many nesting sea turtles. The best swimming beaches are along the northern coast, and include Makalawna Beach, one of the loveliest beaches along the Kona coast; and Hapuna Beach, along the northernmost Kohala coast. Some of the best snorkeling in the islands is in Kealakaua Bay, on the Kona coast; it is not accessible by car and does not have a beach. But there are some great boat tours that will deliver you to the bay for a few hours of snorkeling (Four Winds is a good one). Waikiki is, of course, the most famous beach on Oahu. Known for its excellent waves for surfing, Waikiki is also located in the heart of Honolulu. A good location for a Hawaii beach vacation, there are dozens of high-rise hotels easily within walking distance of Waikiki beach. But its urban location also makes Waikiki a relatively crowded beach. Kailua Beach, on the other hand, is rarely crowded. It's located in a more residential area on the eastern coast (not as convenient if you are staying in downtown Honolulu), and the surf is much milder here. But for most people visiting the islands (who don't surf on a regular basis), the beach has good swimming, kayaking, and boogie boarding. And it has a stretch of soft sand almost 3 miles long! Kailua Beach is considered one of the best beaches in all of Hawaii. 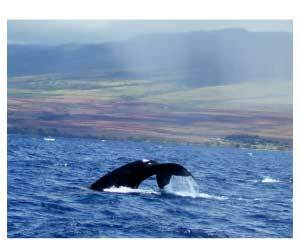 Because it is somewhat protected by its location in the middle of the string of islands, Maui's waters are relatively calm and are great for a Hawaii beach vacation. The beaches of Maui are good for swimming and snorkeling right off the beach. The best beaches on Maui are on the western and southern coasts. These are also the most heavily populated areas, although not nearly as crowded as Honolulu or Waikiki beach. Ka'anapali Beach, on the west coast, is one of the most popular areas of Maui, but Kapalua Bay, a bit farther north, is a prettier area. This area is also a great spot for whale watching from December to March; whales can often be seen right from the beach, but it's even more fun to take a whale-watching cruise and get up close! Ka'anapali Beach is also good for surfing. Wailea Beach and Keawakapu Beach, on the south coast, have great sandy stretches that are good for sunbathing as well as swimming. Snorkeling in Maui can often be done right from the beach, but a boat tour to Molokini Crater offers some of the best sea life. A Hawaii beach vacation on the island of Kauai is a wonderful way to really relax. If the Big Island is the "youngest" of the islands, Kauai is the "oldest". The sandy beaches, in some areas, are vast, with soft, light tan sand. The waves, however, can be much bigger and stronger than the protected bays of Maui or the Big Island. 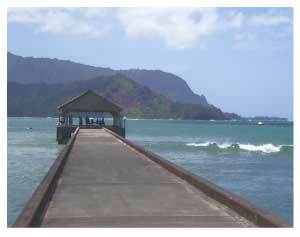 Hanalei Beach, on the north coast, is a great beach for surfing, especially in the winter months. The waters are more calm and better for swimming in the summer. On the south coast, Poipu Beach Park has calmer waters and is a good swimming and snorkeling beach in the winter; the waves kick up in summer, making it a surf destination when Hanalei Beach is quiet. When the surf is rough and swimming is not a good idea, Kauai beaches are still good for long walks to enjoy the scenery. Kauai has many areas that are difficult to access by car; a nice long walk along the beach is a great way to enjoy the view. Need more ideas for your Hawaii vacation? Check out the Top 10 Things to do in Hawaii! Most Hawaii beach resorts are condos - there are really no all-inclusive resorts like the ones you'd find in Mexico or the Caribbean. Condos can be very comfortable, and relatively inexpensive. You'll have a lot more room to spread out and relax (which is nice, if you're spending a week or more there). And even a small kitchen allows you to have a quick breakfast, light lunch, or snacks without going out and paying high prices at restaurants and cafes.